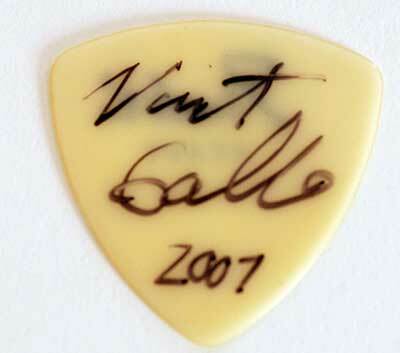 This beautiful white nitrous celluloid pick was used by Gallo every day during the recent RRIICCEE tour. He performed 16 shows in December of 2007 with this single pick. It bugs Gallo seeing a bunch of picks taped to mic stands at live shows. He decided he would maintain possession of one pick for an entire tour. Here it is. Signed by the legend.